What’s it about? When pirate Burger Beard (Antonio Banderas) steals the Krabby Patty formula, SpongeBob and the gang must team up with the villainous Plankton and head to the live-action human world to steal it back. 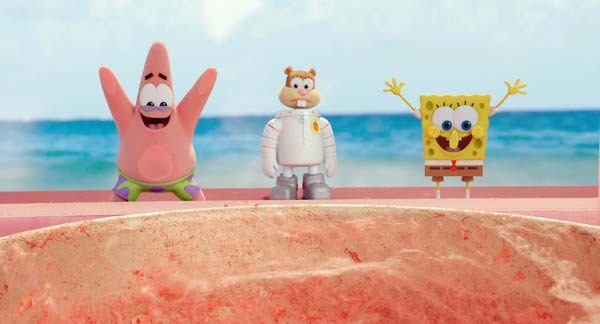 Verdict: The second SpongeBob movie comes 11 years after the first, and again sees them head to the human world – this time, we get to see them as fully-3D CGI characters. But despite the trailer and the ‘Sponge out of Water’ tag line, only the final third is spent with SpongeBob in the real world. The majority of the movie is a traditionally-animated SpongeBob adventure, itself with some impressive 3D. 3D so often adds nothing but a few pounds to the ticket price, but in Sponge Out Of Water it is sensibly worked in and does freshen up the animation for the big screen. The cartoon has been going since 1999, so by now most people watching this movie will know the characters inside out (as does perennial SpongeBob director Paul Tibbitt). This means no time is wasted introducing the audience to anybody. The voice actors, too, have inhabited these characters so are reliably great in their roles, as you’d expect. 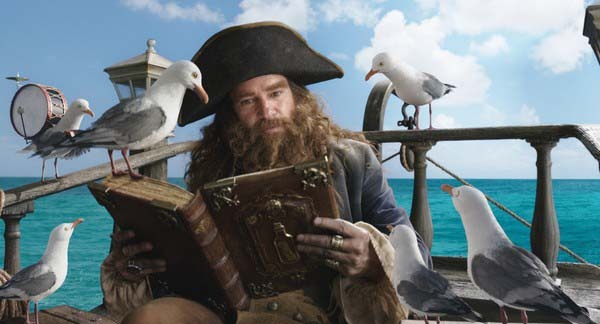 Banderas is eccentrically fun as the pirate villain who fights the team, even if he’s often accompanied by some awkwardly out of place-sounding (and rather unfunny) British seagulls (redubbed in the UK version by the likes of Alan Carr and Stacey Solomon). SpongeBob at its best is hilarious and bizarre, and there’s plenty of both going on here. Funny lines come fairly consistently throughout, but none more so than the Cloudy with a Chance of Meatballs-style puns during a food fight – there’s certainly a hint of Lord & Miller about the script. There are some bizarre moments too, such as the entire character of Bubbles the Dolphin, voiced by Matt Berry, and some influence from The Hitchhiker’s Guide to the Galaxy. The leap into fully-formed CGI characters works well. The characters still feel like their traditional counterparts, so there’s not the disconnect that could be there, even when they essentially become superheroes by the end (again, this is also in the trailers). Perhaps more could have been made of the jump to CGI, as, with the same cartoony physics in place in the real world, there really isn’t all that much point in them being live action other than the initial novelty of seeing them like this. Superhero movies are obviously very successful at the moment, so it’s no surprise they’ve in part gone down this route, though the film might have been better served not striving for the destructive superhero finale, as it doesn’t seem very imaginative. It’s only just over 90 minutes, but it feels longer, dragging in places. There are scenes (and jokes) along the way that outstay their welcome, and could easily have been removed to make it feel like a tighter and better flowing movie. On the other side of the spectrum, there are also plot points along the way that get forgotten about or aren’t explored as much as they could have been. In all, the film is a bit all over the place, and that’s both a positive and a negative. Whilst it is consistently pretty funny, SpongeBob no longer quite has the freshness it once had. In many ways Adventure Time has since taken its place as the all-ages-surreal-cartoon (and will soon be a movie itself), but this movie is a good reminder that SpongeBob can still be very funny at times. Final Words: Seeing a CGI SpongeBob is this film’s selling point, though we don’t see as much of it as the trailers and posters would lead you to believe. Instead, what we get is a largely fast-paced and funny SpongeBob adventure, traditionally drawn but with excellent 3D. There are so many ideas crammed into the movie that some don’t seem fully-formed, but there’s more than enough here to make it worth seeing. It’s nice to spend time with SpongeBob again. The SpongeBob Movie: Sponge Out Of Water is out in UK cinemas today.